In the following BBC documentary Saudi journalist Safa Al Ahmad reports on the ongoing uprising in Qatif and other parts of Saudi Arabia. It contains interviews with Saudi activists and rare footage of protests. The text that follows the video is by Joseph Daher from the Syria Freedom Forever blog. It is the duty of all revolutionaries in Syria and elsewhere to be in solidarity with the people in Saudi Arabia struggling against the reactionary and authoritarian dictatorship of the Saoud. Just like in Syria and Egypt the protesters demanding Freedom and Dignity are accused of being terrorists by their regimes. Our struggle is their struggle, our destiny are links. The road to freedom and dignity is linked to the liberation of all the people of the region, and this includes of course the liberation of the Palestinian people from Israel Apartheid’s State. The attempts by ruling dictatorships and reactionary and opportunists sectarian groups will not be successful to divide people according to their sect, ethnicity or gender. We should fight against these policies and groups promoting these policies and feelings. People in struggle are one. 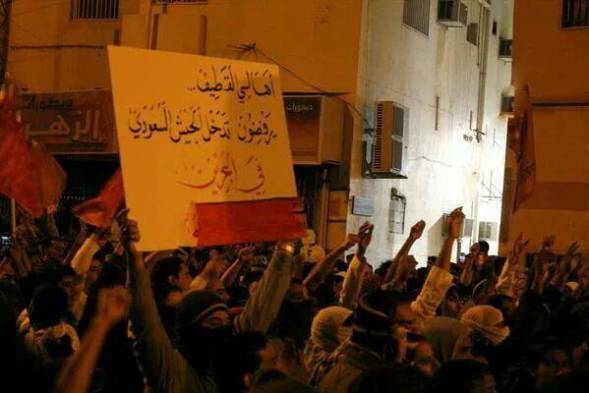 The people struggling in the city of Qatif and in the various cities of Saudi Arabia and demanding the fall of the Saoud regime are actually the best allies of all the revolutionaries throughout the Middle East and North Africa who are themselves struggling for radical change from below in order to achieve democracy, social justice and secularism. The revolution must spread to Saudi Arabia and the other reactionary Gulf monarchies, which are the centre of counter revolution in the region. Solidarity is needed with all the uprisings in the region and elsewhere to free the people from dictatorships, neo-liberalism and imperialism. One of the leader of the protests, Sheikh Nimr Nimr, who still being imprisoned by the Saudi Kingdom, actually said in a demonstration that he wanted the overthrow of the dictators Al Saoud, Al Khalifa and Al Assad. This is true internationalist solidarity. I have not heard yet a single leader of the Syrian National Coalition, presided by George Sabra or from the Coalition for Syrian Revolutionary and Opposition Forces, headed by Ahmed Jarba say such things. This is actually because they have done quite the opposite by seeking at any price the support of respectively Qatar and Saudi Arabia… They could learn a bit from Sheikh Nimr Nimr rather than kissing the feet of these dictators that were close allied of the Assad regime before the revolution and that have tried with all their efforts to transform the Syrian popular revolution into a sectarian war after its outbreak by funding reactionary and sectarian islamist and jihadist military groups. The greatest fear of these reactionary monarchies, especially Saudi Arabia, is to see a successful revolution in Syrian and the establishment of a democratic, social and non sectarian State at its borders. Someone cannot claim to fight for freedom and dignity in one country while allying with dictators repressing their own people who are demanding the same things as the Syrian people. Down with Assad! Down with the Saoud! Down with all dictators! Posted on June 2, 2014, in Middle East and tagged Saudi Arabia, Syria. Bookmark the permalink. Leave a comment.